The category winner for Operational Excellence was Baxter BioPharma Solutions in Halle, Germany for its Oncology Manufacturing Expansion project. Baxter International’s parenteral manufacturing plant undertook a challenging project to add extra capacity to service the CMO market for parenteral oncology and other complex liquid and lyophilised products. 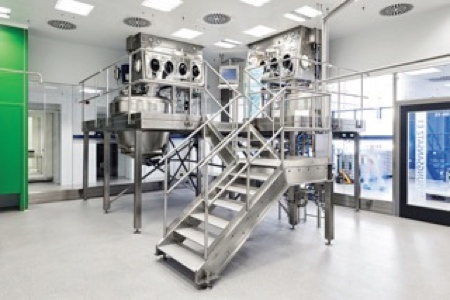 The expansion was designed to accommodate the need for life-saving unit dose products, with the flexibility to offer both large- and small-scale liquid and lyo vial filling, aseptic formulation, terminal sterilisation, and flexible formulation capacity for a variety of parenteral products, small molecules, biologics, antibody-drug conjugates, emulsions, liposomes and suspensions. Baxter applied operational excellence principles to innovative manufacturing concepts with state-of-the-art isolator technology, combined with flexibility for rapid changeover and manufacture of a wide variety of liquid formulations while assuring product quality and economical manufacturing. The use of lean manufacturing principles and 3D design resulted in a facility made largely of glass (>60%), where infrastructure design is optimised for processes in a ‘form follows function’ concept. Designed primarily by in-house engineering staff, all production processes were value-stream mapped, FMEA (Failure Modes and Effect Analysis) applied, and subject to process simulations and computational fluid dynamics. Computer-controlled process flows enabled process standardisation for the mixing, aseptic filling, cleaning and decontamination processes. Janssen Vaccines was the recipient of the Project Execution award for its ‘Fast Track Refurbishment for Ebola Vaccine Production’ based in Bern, Switzerland. In response to the 2014 Ebola outbreak, Janssen committed to accelerating the development of its candidate Ebola vaccine. Through parallel activities in process development and facility design and construction, the facility was completed for engineering runs by September 2015. It was important that the design space was able to accommodate possible process changes without affecting the schedule for completion of the facility. Pfizer Inc, Groton, CT, US, won the Equipment Innovation category for its Portable Continuous Miniature and Modular Collaboration, creating the next generation of oral solid dosage processing technologies. 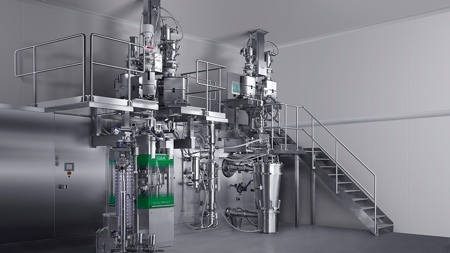 Pfizer, GEA and G-CON Manufacturing formed a consortium to design and build a portable, autonomous manufacturing environment for continuous oral solid dosage production using GEA’s ConsiGma 25 system and G-CON's modular system. Installed at Pfizer’s labs in Groton, CT, the current prototype transforms raw materials into uncoated tablets in minutes. The equipment fits in a portable facility called a POD that can be shipped to any location to get medicines to patients when and where they are needed. G-CON’s POD system comes fully assembled and is functionally tested prior to shipment to the final assembly site. Both the process equipment design and POD designs had to be conducted in parallel. Throughout the collaborative design process, innovative approaches were incorporated into the project to increase speed, enhance quality and reduce overall project cost. The design of the customised air-bearing and POD lifting system allowed the PODs and process equipment to be positioned and installed into a grey space warehouse within one week from receipt at the landing location. The project required lower upfront investment compared with traditional facilities; it resulted in up to 35% energy and resource savings, and offered a reduced environmental footprint. Takara Bio Inc was judged winner of the Facility Integration award for its Centre for Gene and Cell Processing (CGCP) in Shiga, Japan. To improve operational and cost efficiencies, Takara housed cell products, viral vectors and recombinant proteins all within the same facility. Each of the three functional areas, under appropriate pressure cascade, has a separate entrance for personnel and raw materials via one way paths, thus lessening the risk of cross contamination. Rooms were constructed with double ceilings and full height partitions to close any contamination pathway. The air conditioning systems were completely segregated with HEPA filtered exhaust and UPS/generator power supplies to significantly reduce the risk of airborne materials contaminating the other areas. Processes include single-use systems, dedicated equipment and Restrictive Active Barrier Systems (RABS). The RABS sterilisation process uses a dry type vaporised hydrogen peroxide (VHP) sterilisation process. The air conditioning system ensures uniform HP has become fully vaporised. This sterilisation process provides fully automated control of the interior temperature and humidity during sterilisation and the VHP concentration. The judging panel recognises the facility innovations and the reasoned handling of risk and looks for on-going success with additional regulators and manufacturing campaigns to further support this approach as a practical, efficient model for future biopharmaceutical facilities. West Pharmaceuticals Services was recognised for its facility expansion in Kinston, North Carolina, US. The primary component supplier is raising the bar on how these components are manufactured. While expanding to introduce new RS product capabilities the firm decided to upgrade its facilities. The facility expansion was designed with transparency and compliance in mind. A new glass wall system makes the process visible to customers, eliminating the need for visitors to gown and enter controlled areas, thereby minimising production interruptions and contamination concerns. Phones are strategically located so that customers can ask production staff questions while manufacturing processes are taking place. Enhanced HVAC and environmental monitoring systems allows West Kinston to tightly control its production environment, ensuring quality products for customers. Special care was taken to introduce a cleanroom design that has become the standard within the West manufacturing network. Lean techniques and principles were used during design to optimise flow, eliminate waste and facilitate quality and compliance. Greater Pharma Manufacturing, located in Bangkok, Thailand is the first of its kind to apply Western standards to design, build and operate a pharmaceutical facility to produce tablets, capsules, sachets and liquids for the local ASEAN market. Greater Pharma undertook initiatives to change outdated practices and build a facility similar to those typically seen in the US and EU. The plant is the first pharmaceutical plant in Thailand to use: closed processes from raw material to the finished products; the vertical concept; an energy conservation design concept. The plant uses locally sourced design solutions and equipment. Capital cost was at the low end of plant cost in Thailand but with more efficient running costs. ISPE will be adding a new category to the 2017 Awards: Facilities of the Future. This honour will be awarded to the project that best demonstrates the application of innovative concepts to design flexible and effective pharmaceutical facilities. The 2016 Category Winners will be formally recognised at the ISPE Facility of the Year Awards Banquet on 7 June, 2016 in North Bethesda, Maryland, US. The banquet, held in conjunction with the ISPE/FDA/PQRI Quality Manufacturing Conference, will feature presentations from the FOYA judging panel and other noted industry leaders. The 2016 FOYA Overall Winner will be announced at the 2016 ISPE Annual Meeting from 18–21 September in Atlanta, GA, US. For full details of the event and winners visit www.facilityoftheyear.org.